AoE Installation Tool 3 is not an upgrade of the 2.0 version, but a total new program recoded by 0 (although some of main things have remained), so I uploaded it as a new Miscellaneous File. When the beta period will end I will update this file. AoE Installation Tool 3 requires .NET Framework 4.5, so, for now, it's not compatible with Windows XP. If you have Windows 8 you will have no problems to perform it, instead if you have Windows Vista or Windows 7 you need to download and install .NET Framework 4.5 from Microsoft site. 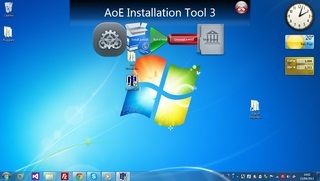 AoE Installation Tool 3 beta is my last creation of modloader for Age Of Empires III. This is a beta version, for the big number of features which it3 contains, we don't guarantee a perfect working of it3 every time. Since it lets you to run mods on aoe 3, if something goes wrong with mods you will need to reinstall game (this is rare, most bugs are not related to game). Nothing should happen (I tested all the "risky" features until a perfect working of them). Besides, to avoid issues, for every mod it3 makes a backup of the files which mods would modify in Documents\AoE Installation Tool 3\Backups\[Mod name]\. Anyway knb.dll using should allow you not to have any kind of problem related to this.